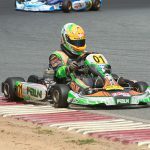 The final day of the 2016 United States Pro Kart Series event at the GoPro Motorplex went into the books Sunday. It was another hot one, with temperatures well into the 90s, the complete opposite from the three previous visits to the Mooresville, North Carolina facility. The action on-track was hot as well all weekend with competitors on the edge to earn the first victory or help their position in the championship chases. Brandon Lemke was able to extend his championship lead with a double win weekend in IAME Pro, taking home a total of $3,750. Dakota Pesek made it four victories on the season with a dramatic finish in the Yamaha Pro category. Merlin Nation swept the Junior ranks with Sam Mayer and Alex Bertagnoli. There was no clear-cut leader of the Franklin Motorsports IAME Pro category throughout the day. Austin Garrison (CompKart) began as the top qualifier while Brandon Lemke (Merlin) and Ryan Norberg (Tony Kart) winning the heat races. Norberg earned the pole position for the main event, and retained the position through the opening lap with Armin Cavkusic (FA Kart) coming up from seventh to second. On lap four, Cavkusic attempted a late move going into the Monza corner, making contact with Norberg and sending both off course. This gave Lemke the lead with Braden Eves right there. The two paced the field for the remainder of the race, as Lemke notched his fourth victory of the year. The double win weekend helped give him the IAME USA East bonus of $1,500, adding to the $1,000 for each win. Eves crossed the line in second, however, was removed in the tech barn for a engine issue. 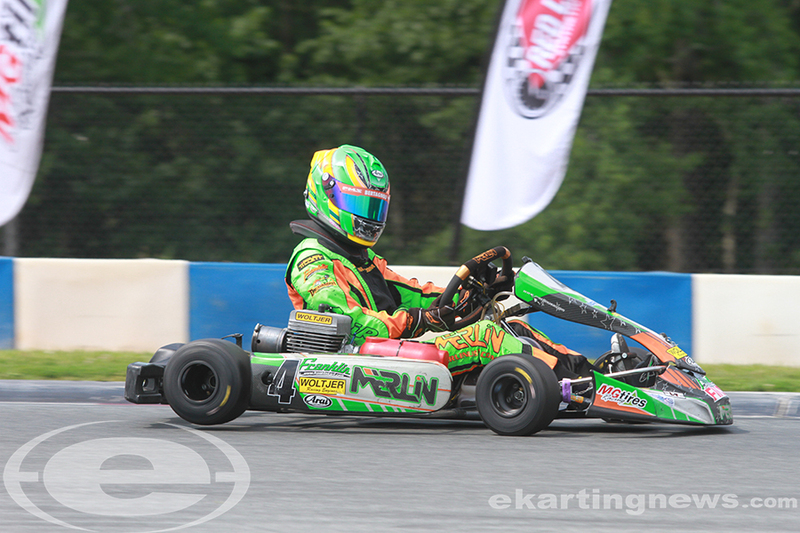 This elevated Bradley Zilisch (Tony Kart) to the runner-up position for his best result of the season. CompKart driver Austin Garrison rounded out the podium in third, working past Marco Maestranzi (Top Kart) with David Ilavia (CompKart) notching his best finish of 2016 in fifth. The $100 DeepSeat Hard Charger award went to Zach Holden as the Comet Kart Sales / Tony Kart driver came from 27th to seventh, just behind Dalton Dow (Birel ART). Jacob Donald (Praga), TJ Koyen (Exprit) and Mike McAndrews (Fullerton) completed the top-10. As we have seen all season long, the Comet Kart Sales Yamaha Pro came down the final lap. Brandon Lemke (Merlin) set the pace throughout the day with fast time in qualifying and the win in both heat races. Dakota Pesek (Top Kart) and Chuck Tate (Parolin) kept pace with Lemke, with Pesek taking turns at the lead with the Senior rookie. Pesek led at the white flag with Lemke in third. He worked past Tate in turn one and then by Pesek down the back straight. More exchanged happened in the hairpin and the corners to follow, ending up with the three drivers going three-wide to the final corner. At the kink before the last turn, contact was made with Pesek on the inside, Tate in the middle and Lemke outside. Tate and Lemke got the worst of it, as they all went for the same piece of real-estate. Lemke chucked a chain with a busted rear gear and Tate went off into the wall hard. Pesek continued on, crossing the line for his fourth victory of the season. Jake Venberg (Merlin) was gifted the second position after working past both Zach Holden (Tony Kart) and Kevin Nelson (Tony Kart) late in the race. It was the best finish for the Senior rookie on the year. Holden ended up third with Jake McWhirter (Tony Kart) pushing Nelson back to fifth. 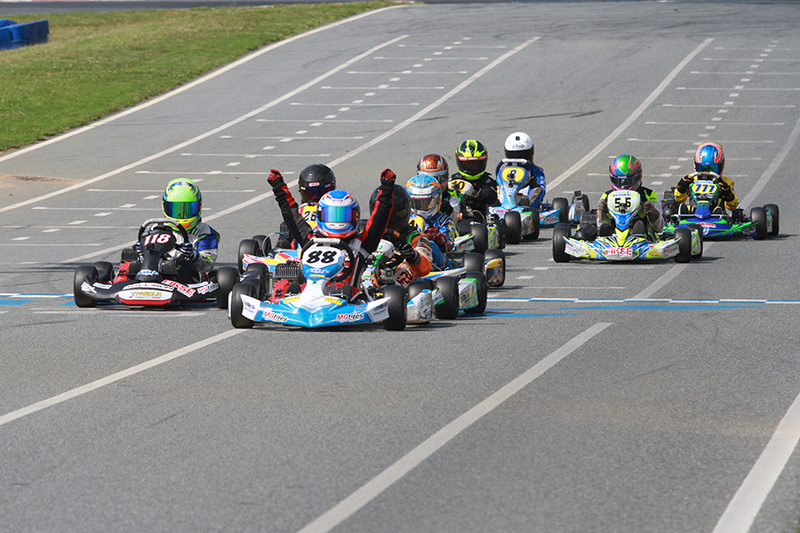 Myles Rowe (Tony Kart) led the field to the green flag in the Innovative Performance IAME Junior main event after winning both heat races. Top qualifier Sam Mayer (Merlin) was slotted back in sixth after a busted chain and getting run over by Luke Wallace (Tony Kart) in the final corners. Rowe played the defensive line early, and it cost him, making contact with Alex Bertagnoli (Merlin) on the second lap, ending his race early. Austin Schaff (Merlin) took over the lead until Lance Fenderson (Tony Kart) assumed the position. Mayer worked his way forward quickly, into the lead by lap eight, as he and Fenderson were able to pull away from the rest of the field. Fenderson bought his time behind the Saturday double winner, waiting until the last lap. The now Mooresville resident made his move at turn four, and was able to space himself away from Mayer to eliminate any overtaking opportunity in the closing corners to land his first victory 2016. Mayer settled for second with Schaff completing the podium in third. 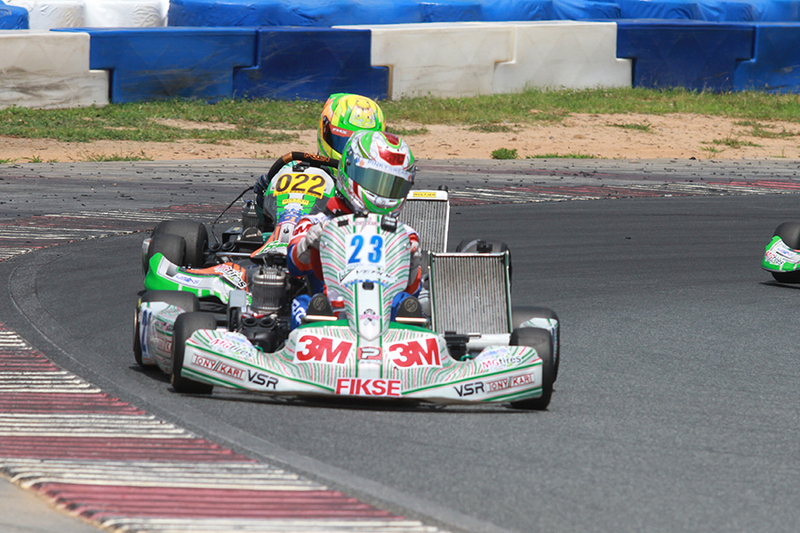 Bertagnoli was fourth and Nicholas d’Orlando (CompKart) improving throughout the weekend to end up fifth. Nearly the entire field made up the lead group during the Woltjer Racing Engines Yamaha Junior final. Top qualifier Sam Mayer (Merlin) paced the field during the 15-lap race, eventually bringing Alex Bertagnoli (Merlin) with him toward the end of the race. With two laps to go, Bertagnoli pulled the trigger and pressured Mayer for the lead. The two went back and fourth with Bertagnoli able to reach the checkered flag first to claim his first victory in the category on the year. Mayer settled for another runner-up finish on the day to pair with his two wins on Saturday. Colin Neal (Tony Kart) won the battle for third to claim a second podium finish in 2016. Arie Venberg (Merlin) and Ben Varner (Merlin) completed the top-five. 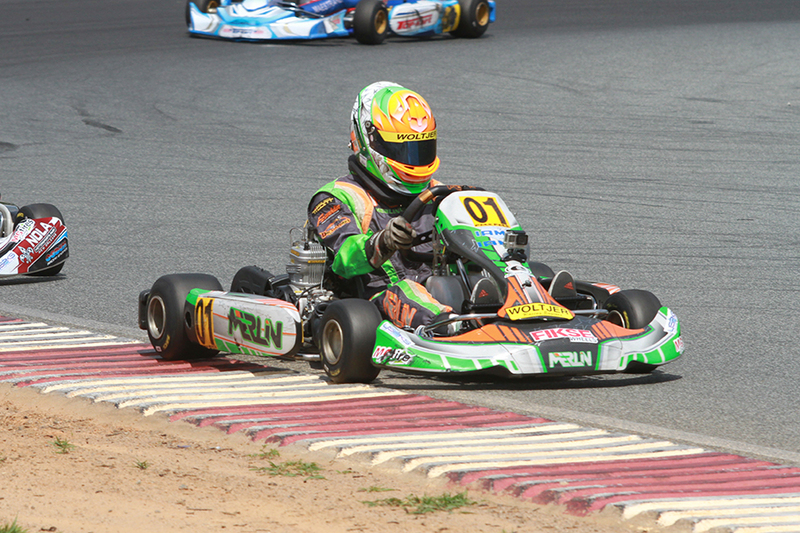 Nothing can stop Reece Gold in the Allison Racing Engines IAME Cadet category, not even flipping his kart. After securing the pole position in qualifying, Gold was involved in an accident following the checkered flag that resulted in him going upside down. His Benik team bounced back to get his kart ready, placing second in heat one and winning heat two. Gold paced the field early in the main event until Gray Leadbetter (Top Kart) took the position away on lap 11, with William Robusto (CompKart) right there. Gold was able to retake the lead on the final lap, crossing the line first for his fourth victory of the season to extend his championship lead. Leadbetter settled for second, her best result of 2016 with Saturday winner Robusto in third. Tyler Maxson (Benik) was fourth and California driver Colin Queen (Tony Kart) in fifth. 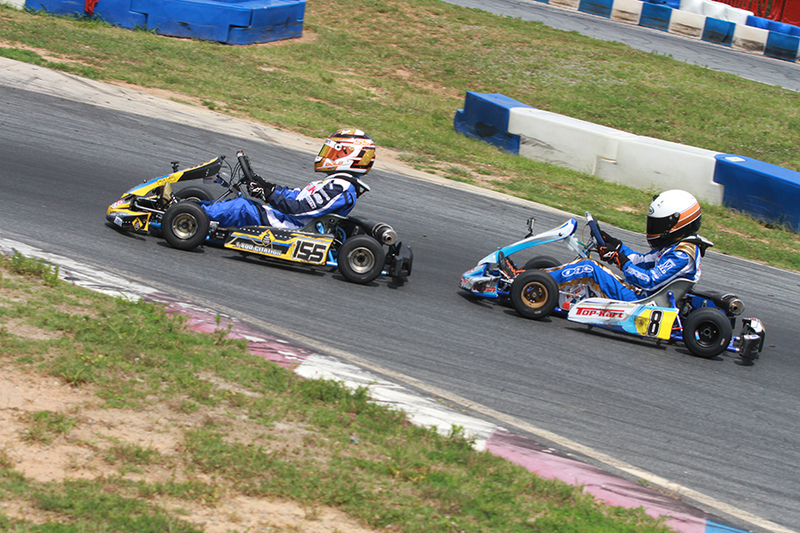 The lead pack was 10 drivers for the Switch Racing Engines Yamaha Cadet main event. Colin Queen (Tony Kart) led the field to the green flag, pacing the field early until he was shuffled back, out of the lead group. Logan Adams (FA Kart), subbing for his brother Garrett Adams, worked his way to the point on lap three after starting fourth, coming from the tail of the 17-driver field in each heat race to finish fifth. Adams led for just three laps until William Robusto (CompKart) took a turn and then Caleb Bacon (Parolin) assumed the position. Bacon paced the field to the final lap as the rest of the group jockeyed for position. On the final circuit, Bacon kept the group at bay until the final corner. Kyle Thome (Merlin) dove for the lead, pushing both drivers wide on exit. Nicholas Terlecki (Ricciardo) was right there, and was able to slip past both. The field fanned out behind him, as the Cadet rookie took his first victory of the year. Thome crossed the line second with Bacon in third. 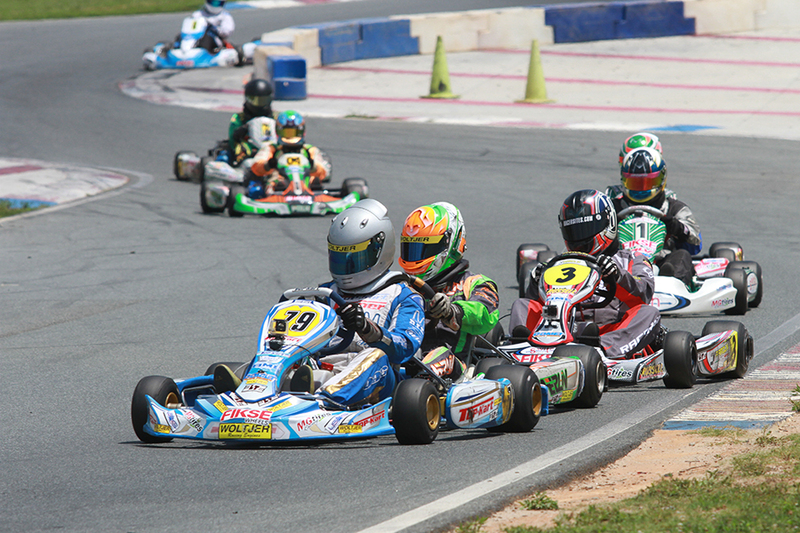 Adams finished fourth and Aiden Crouse (FA Kart) was fifth as the entire top-10 crossed the line within one-second. Championship leader Brent Crews (Energy) bought his time on the day, coming back with his fifth victory in Motorsports Driver Development IAME Rookie. Eli Trull (Vemme) became the driver to beat after winning both heat races. Crews settled into second in both and the two pulled away from the field in the 12-lap main event. Crews led all 12 circuits, but not without a fight on the final lap. Trull took over the point until the final corner, as Crews retook the position and crossed the line first for the victory. Second place was Trull’s best finish of the year. Sam Corry (OK1) won the battle for third over Paige Crawford (Tony Kart) and Saturday winner Mateo Rubio-Luengo (Kosmic). Despite just seven drivers in the field, the finish in QPS Employment Group Yamaha Rookie was among the best all weekend. The top four drivers shuffled for the lead and set the pace with polesitter Eli Trull (Arrow) and Alex Powell (Birel ART) taking turns at the lead. On the final lap, Trull and Mateo Rubio-Luengo (Kosmic) tried to slide past Powell at the final corner. They all drifted wide and Paige Crawford (Tony Kart) went from fourth to first in just a few feet, and reached the checkered flag first for her third victory of the season. Trull ended up second with Powell in third. Saturday winner Mateo ended up fourth with Shawano double winner Elliot Cox (Benik) in fifth.